Japanese manga artist Nobuyuki Fukumoto is known for dealing with themes towards the darker end of the spectrum, with gambling and the Yakuza typical features of his storylines. In the late 1990's he found he had a hit on his hands with his character Kaiji and the story "Gambling Apocalypse"; what a title! The series went on to become two TV anime series and, in 2009, a live-action movie was released. Gambling and manga, as well as comic art in general, make fantastic partners. They're both about entertainment and escapism, about finding a way to forget the drudgery of day-to-day life for a little while. Japan is notorious for its overworked office employees, and though most gambling is illegal, at least for now, the series obviously struck a nerve with Japanese readers. These days, internet gambling worldwide continues to grow, and some online casinos, including CasinoSagaFans.com even incorporate comic/fantasy art into their themes. The results are immersive and more evocative of the comic-book experience than the usual online casino - even if Japanese players can't legally access them yet! 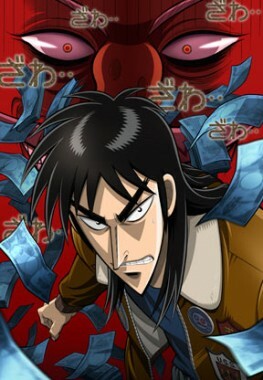 In season 2, first broadcast in 2011, there was no let-up for Kaiji. He finds himself condemned to working in a mine in appalling conditions, with no chance of paying off his debt and becoming a free man. Overall, the storyline explores the idea that people are sometimes forced by poverty to do desperate things. However, the underlying idea that there is always hope lifts Kaiji from being just an exercise in bleakness and cruelty. The crazy gambles he takes along the way are understandable in context, though you'll swear you'd never accept them yourself in the same position!